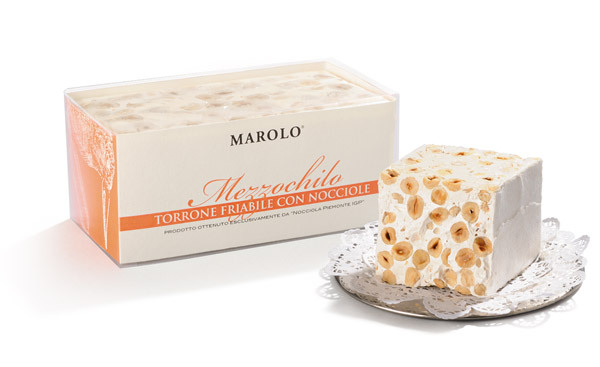 DESCRIPTION: from a recipe purposely created in cooperation with Paolo Marolo, this TORRONE is obtained by handwork in little bain-marie boilers with a slow cooking, preserving the aromatic qualities of the raw materials. The ingredients are top-quality ones; the extremely fragrant honey and the refined sugar exalt in this TORRONE the unique taste of our Piedmontese IGP hazelnuts. PACKAGING: the product is presented in 500g. blocks with transparent packageand MAROLO logo wrapper. Torrone friabile "Nocciole Piemonte IGP"